In contrast to the executer’s framework, the achievement mode happens on a strategic level. It’s not as low as the execution in the dirt but also not as high and meta as the clouds. If you don’t know about concept of the dirt and the clouds read the explanation first, then continue reading here. Alternatively you can watch the explanation in a quick 1-minute video. Execute towards it: one step, next step, repeat. Found a gem. Does it help your goal? No? Move on, it’s a distraction. Found another gem that helps your goal? Great! Take it, it’s an opportunity and move on with your execution. Restrict yourself to the amount of things you expose yourself to. This makes sure you always know where you’re standing. Don’t overwhelm yourself with input that misleads you into a direction you don’t want to head to. The same goes for content and people. Not every content/person is appropriate for your current goal. Consider inappropriate content/people a virus that infects you and makes you less capable to perform towards your goal because it’s a distraction. Remember, when you have your goal clear there will be opportunities and distractions. Opportunities are aligned with your current goal. Distractions are not aligned with your current goal. Use opportunities. 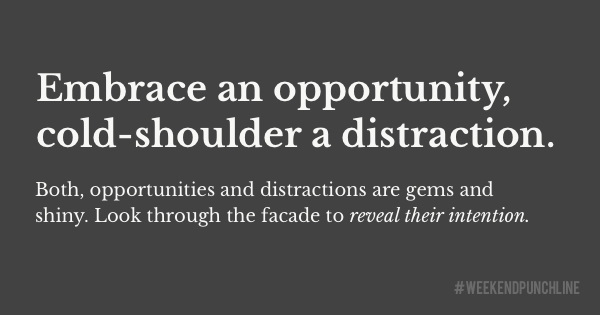 Dismiss distractions. Yes, it’s hard to know which one is which but your decision will show you. Keep in mind: When you make the decision be all-in on it and stand behind it until you course-correct. It’s a lot about what you feel is right. But if you feel it’s the right thing and do the right thing, it’s always the right thing. This was episode 6 of the #weekendpunchline . Every Saturday and Sunday.